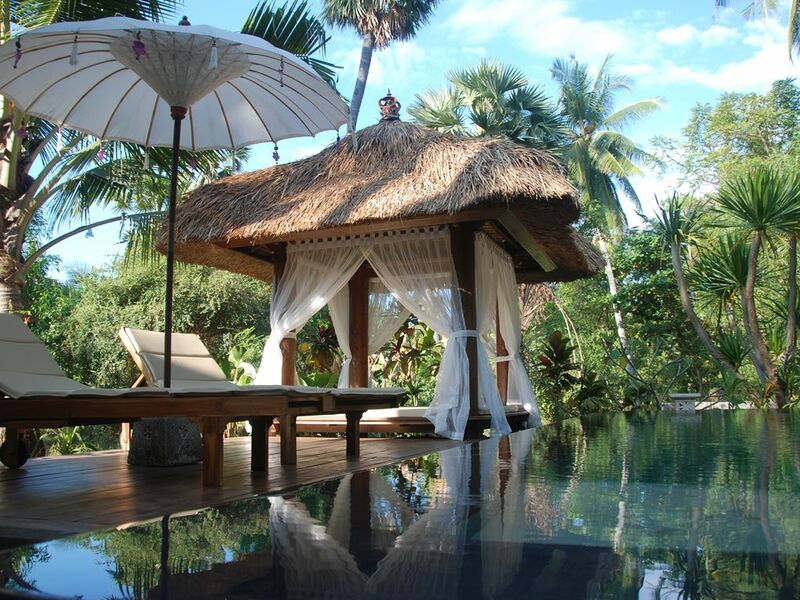 Villa 'Paradise' is a beachfront villa situated in North-East coast of Bali. It's build in tropical modern style and comfortable for accommodating 2 people. For a couple with a child we can provide baby-cot or put mattress on the floor. Spacious air-conditioned bedroom is combined with bathroom that leads to open sunny shower. Small kitchen near Infinity pool, wooden deck with two sun beds and gazebo are situated in hidden zone near the villa. In the direction of the ocean you'll find half open living room with ocean view. There is a DVD, a sofa and a coffee table with two armchairs. Stone path will lead you to the second wooden deck also with the sun beds right on the beach, where you can relax enjoying the ocean view, make massages or have a romantic candlelight dinner with a bottle of wine. We can help you in arranging tours around the island, massages, yoga, fishing, kayaking and diving. There is a nice reef in front of the villa both for snorkeling and diving, equipment is available for rent. Also you can enjoy the view of northern part of the Bali from the ocean during the fishing or romantic trip on our speed boat. Close to villa 'Paradise' is situated 1BR villa 'Sunrise' that was build according the same project. The only difference is that 'Sunrise' doesn't have a living room and the jungle path to the beach is not paved. The rent price of 'Sunrise' villa is lower on 20%. Our staff will be happy to cook for you and serve the meals the villa. You can either prepay the meals for the whole period of your stay $15 per person per day or pay on arrival breakfast - $4, lunch - $6, dinner - $9. - snorkeling equipment (including boots, fins, mask and snorkel) $5. - underwater spare gun (per day) $20. - diving equipment (SCUBA) $20. - guide assistance by a certified rescue diver (PADI), including a pre-dive briefing / per dive $25. - OWD (PADI Open Water Diver course) (3 days) / person $400. - boat rent / per hour / per day $40 / $200. - kayak with glass window / per day (we have 2) $15. - fishing with a local fisherman $20 per hour. On the local reefs (including home reef): $40 per dive (the guide is included). Wreck diving - $ 60 (including diving equipment, transportation, guide and government taxes). Visit the Traditional Morning Market in Les village (6-9 a.m). Check on the exotic fruits! Day # 2 (half day trip - an hour drive one way). Tirta Ganga (Water of the Ganges) is the site of a holy temple, some great water features and some of the best view of the rice fields. Nice place to stop for around one hour or so. Taman Ujung – the last king of Karangasem built this grand water palace, but it was damaged by earthquake. A part of old palace is surrounded by ponds and terraces. Rafting on Telaga Waja river. As you float along, you can admire the wild jungles and rice paddies. Dress to get wet and bring something dry for afterwards. The price is from $ 50-79 (discounts are common). Besakih Temple - the most ancient and most important temple in Bali. In fact, it is an extensive complex of 23 separate-but-related temples. Unfortunately, many people find it disappointing, because the holy place turned out to be a tourist object. There a great number of “guides” who will tell you that you need their service. You don’t. The reason is you might be hit with a huge fee at the end of the tour. Fixed entrance fee is 15.000 Rp. Art Zoo – the outdoor art gallery of an American artist Symon who has lived in Bali since 1972 and has a taste for the exotic. Outside his place is sign saying ‘Danger Art!‘. Symon’s paintings use very vivid colors .The place itself is an artist’s dream, plenty of light and places for hanging the art. The view from the upstairs loft is great too overlooking the ocean. (20 minutes drive - Singaraja direction). Chinese Temple, a riot of gold paint, red and yellow paper lanterns and crouching dragons. Monkey Forest. Have a nice walk through the cool jungle with its riverside trails, super-sized trees and moss-covered temples with plenty of monkeys living there. Ubud is an art center of Bali, its cultural capital. There a lot of galleries, artists’ studious and art shops. Hot Springs. Surrounded by lush jungle-like gardens, this hot springs are guaranteed to relax you. Bedugul. There is a temple and a park on the beautiful lake. Botanic garden Different kinds of flowers and trees from all over Indonesia. There are plenty more to see and to do in Bali, just ask! There are many good things about Octopus villas like when you close the wood doors to the villa you find yourself in a beautiful setting. But if you leave the very small confines of the villa you find yourself in no mans land. Nothing but a very dusty dirt road leading to the highway on one side and once you get to the highway there is nothing there and on the beach side unless you have on heavy fin boots the rocks are impossible to walk across. The snorkeling is a highlight for this spot. So for a 24 to 48 hour stay where you want to lock yourself up in a small compound this is very good. But the 2 to 3 plus hour drive from Ubud or the airport or just about anywhere else that you want to go on Bali makes the short stay a very unpleasant option. One final point the staff in general is very nice and works hard to support their guests. But we had a couple of issues.1. Th owner forgot to order a message for us on our last day that we really needed and 2. The two rental cars that the staff arranged did not have any air conditioning and the one that took us to the airport did not have seat-belts for one of our passengers while the driver drove like a crazy person through mountain and busy roads.. We found the taxis to be excellent everywhere else on in Bali just not at this location. Not really clear why the guests are so disappointed with the stay as they rent the villa with its territory and not the surrounded area. All the North part of Bali is with pebble beaches. Also not clear why the guest is giving wrong information about our transportation, as all cars are air-conditioned. Before the guests book we always say that we are happy to accommodate you if you consider yourself a happy person. As if you happy you tend to notice good things. Incredible , quiet and relaxing. Anna and her staff were all very kind and helpful. They were quick to respond to our questions and always made sure we were happy. Provided us with snorkeling equipment to explore a beautiful reef just in front of the villa and a scooter to drive to the nearby waterfall, temple and weaving factory. The food that was served at the villa was incredible, excellent menu and all the dishes exceeded our expectations. The villa itself is very clean at all times and beautifully decorated. All the facilities are comfortable. The quality of everything was exceptional and the prices were very fair. We absolutely loved our stay here and were sad to leave. Hopefully we’ll be back! trekking on Bali's tourist attractions.